Travelling Italian fans in high spirits before Champions League quarter-final. 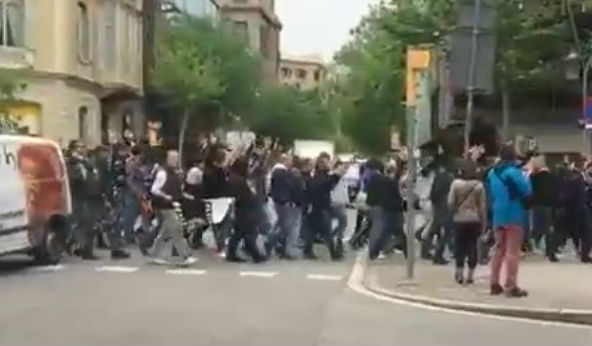 Watch these Juventus supporters in Barcelona chant “Catalan motherf***ers” in perfect Spanish as they march through their host city. A 0-0 draw at the Camp Nou was enough to take the Serie A giants into the semi-finals of the Champions League following a 3-0 first leg victory in Turin. With their side also eight points clear at the top of their domestic league, no wonder the travelling Juve fans were in high spirits. Marching down what looks like Barcelona’s famous Las Ramblas, the Italians chant “Catalanes hijos de puta” (“Catalan motherf***ers”). This provokes one or two titters from bystanders, including whomsoever was filming it, so hopefully it was all good-natured.